ALEXANDRIA, VIRGINIA – June 29, 2012. USACE IWR and ICIWaRM Director Bob Pietrowsky and Drs. Will Logan and Eugene Stakhiv, the Deputy and Technical Directors of ICIWaRM, respectively, attended the 20th session of the Intergovernmental Council (IGC) of UNESCO’s International Hydrological Programme (IHP) on June 4 — 7 in Paris, France. The IHP Intergovernmental Council is the main governing body of UNESCO’s important freshwater program. USACE IWR’s International Center for Integrated Water Resources Management (ICIWaRM) is affiliated with the United Nation’s (U.N.) IHP Programme as a “Category 2 Center,” meaning that ICIWaRM is hosted and resourced by the U.S. but is part of a global network of water centers by supporting IHP water resources activities through its association with the U.N.
As such, ICIWaRM represents an intergovernmental partnership between USACE IWR and several U.S. universities, professional societies and non-governmental organizations. Key among ICIWaRM’s activities, the center hosts the Secretariat for the IHP’s Water and Development Information for Arid Lands — A Global Network (G-WADI). Significantly, ICIWaRM support to the IHP and participation in the 20th Session also included significant contributions by Dr. Maria Donoso, Florida International University (FIU), and Dr. Richard Meganck, Oregon State University (OSU). Dr. Donoso is the Director of FIU’s Global Water for Sustainability Program (GLOWS) and at the Council Meeting presented the Phase VIII draft strategy as lead author of the IHP strategic writing team. Dr. Meganck, the former Rector of UNESCO’s Institute for Water Education (IHE-Delft), is a member of the U.S. National Commission for UNESCO and attended the Council meeting in support of the delegation as liaison to IHE-Delft and Brazil’s Category 2 Center for Education, Capacity Building and Applied Research in Water (HidroEx). The official U.S. delegation was headed by Dr. Matthew Larsen of the U.S. Geological Survey and Chair of the U.S. National Committee for the International Hydrological Programme (IHP). Bob Pietrowsky, who represents USACE on the U.S. National Committee for the IHP, served as deputy head of the delegation. Dr. Verne Schneider, International Water Resources Chief, USGS, and Dr. Ingrid Verstraeten, International Program Specialist, USGS, along with Drs. Stakhiv and Logan of USACE-IWR ICIWaRM, also served on the official U.S. delegation. As part of the kick-off of the IHP Intergovernmental Council Meeting, the U.S. 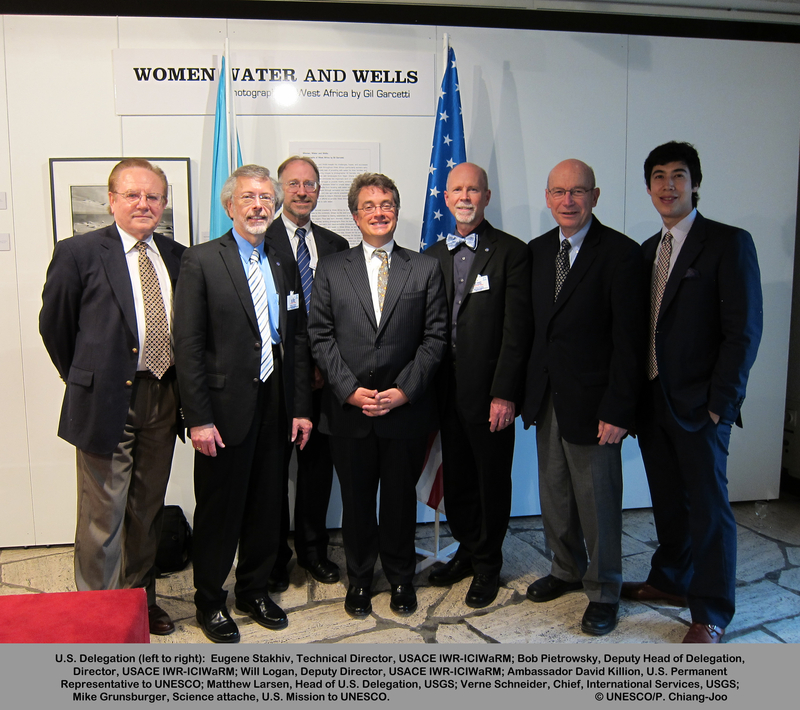 Permanent Representative to UNESCO, Ambassador David Killion, hosted a special reception at UNESCO headquarters which celebrated a weeklong photo exhibit at UNESCO titled “Women, Water, and Wells: An Exhibition of Photographs of West Africa” by American photographer Gil Garcetti. 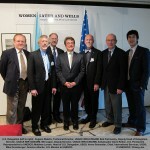 The Intergovernmental Council Meeting served as an opportunity for USACE IWR-ICIWaRM to strengthen its connections within IHP’s networks and included a signing ceremony between ICIWaRM and another Category 2 Center, the United Kingdom’s Center for Water Law, Policy and Science Hydrology, located at the University of Dundee, Scotland. Both ICIWaRM and the University of Dundee share an interest in IHP’s Hydrology for the Environment, Life and Policy (HELP) program, and envision cooperating in such areas as water policy and integrated water resources management (see related news story). ICIWaRM scientists also met with leaders from other IHP Category 2 Centers in Japan (International Center for Water Hazards and Risk Management — (ICHARM), the Dominican Republic (Center for the Sustainable Management of Water Resources in the Caribbean Island States — CEHICA), Chile (Center for Arid and Semi-Arid Zones of Latin America and the Caribbean — CAZALAC), Poland (European Regional Centre for Ecohydrology — ERCE), and Brazil (HidroEx) to explore potential future joint activities. USACE IWR-ICIWaRM also actively participated in an evening meeting organized by the IHP Secretariat with the Institute for Water Education (IHE), The Delft, Netherlands, and the approximately fifteen IHP Category 2 Centers in attendance at the Council meeting, sharing respective activities and working towards additional global and regional networking and enhanced electronic communication mechanisms between centers. Multiple informal side meetings were also held with representatives from new Category 2 Centers/IHP National Committees from Nigeria, Kenya and South Africa. Selection of a new Chair of the Council — Dr. Johannes Cullmann, Germany. Review of the accomplishments and outcomes of IHP Phases VI and VII. Endorsement of the strategic plan for Phase VIII of the IHP for 2014 to 2021, entitled “Water Security: Reponses to Local, Regional, and Global Challenges”. Phase VIII’s primary themes include: water-related disasters, groundwater in a changing environment, water scarcity and quality, water and human settlements, ecohydrology, and water education. Approval of the formation of a working group to develop an implementation plan for IHP-VIII, complete with goals, objectives, and various metrics designed to measure progress. Endorsed proposals for new Category 2 Water Centers, including the International Centre for Water Security and Sustainable Management at the K-water Institute, Daejeon, Republic of Korea; the International Centre for Water Cooperation in Sweden; and the Regional Centre on Groundwater Management in Uruguay; along with conditional endorsement of a fourth center — the Centre on Water for Sustainable Development and Adaptation to Climate Change in Serbia. The IHP has been a leader in international hydrology since it was established in 1975 in order to facilitate intergovernmental cooperation in water sciences and water resource management. Documents, resolutions and meeting reports can be found on the UNESCO IHP website: UNESCO IHP website .